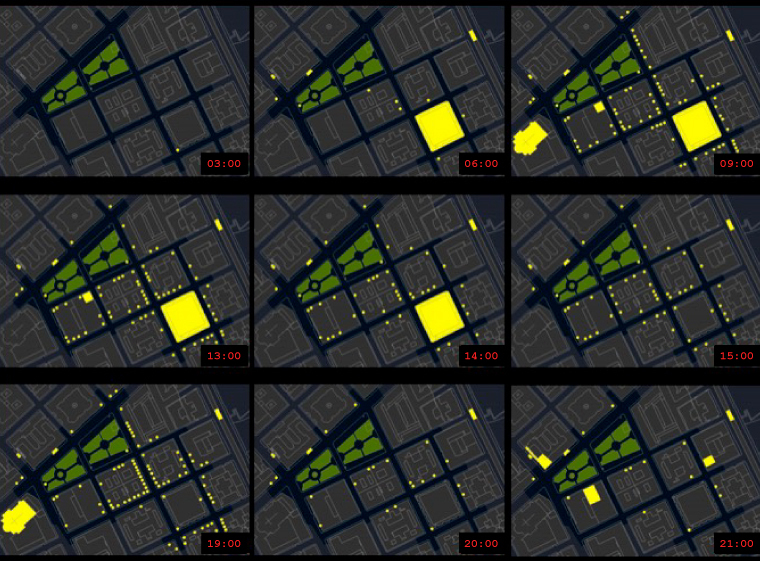 This article discusses the techniques used for the production of the video “Rhythms and faces of an accidental place”, which is developed as a tool of time-conscious urban planning. Time-conscious urban planning takes into consideration urban rhythms and explores how to use them to improve the general urban dynamics.. Through the combined use of temporal-maps and photography we tried to reproduce the place as an “architecture of relations” that lasts for the duration of an action in space which cannot be separated from the space in which it takes place. Piazza di Santa Maria Liberatrice was renovated 15 years ago, according to the suggestions of the local residents. The market area in Piazza Testaccio is part of a project of the redevelopment of the square after the market was moved to a nearby area (this change occurred a few months after the implementation of our video). We believe that the use of this tool can help stakeholders to understand rhythms of these spaces and to include a temporal dimension in the redevelopment project. In order to work with a space-time approach in co-design workshops and participatory design we need tools that are able to welcome different points of view, involving the perception that each subject has of a place. Our video allows the combination of a technical detached vision, typical of maps used by planners, and a bottom view, conveyed by common photography, that is typical of ordinary people. The project tries to capture an urban place as it is being lived and to show it as a part of an “inhabited city”, whose identity is constantly defined by those who live there in that moment (Bonfiglioli S., 2009). We tried to convey the sound of an urban public space, conceptually defined by time-oriented urban planning as a place inhabited by a mix of people, both temporarily present and resident, according to characteristic rhythms of use. space: design of public space, architectural elements, activities. time: hours, days, seasons, weather; opening/closing systems and calendars. inhabitants: residents or temporary inhabitants (commuters, city-users, businessmen); people of different ages, with different mobility conditions; their faces, movements, activities. Mix of different people in the same place at the same time or different people in the same place at different times. chronomaps: technical dynamic tools characterised by a zenithal vision, that shows the rhythm of the place, integrating spatial and temporal phenomena, as opening/closing systems and calendars, the different population’s profiles and mobility behaviours. photography: that shows, from the perspective of the pedestrian, within the place, the faces of those who live in that place in that moment, giving to the place an accidental identity. Since the beginning of the ’90s a network of European Universities collaborated on researching the role of cartographic tools in time-oriented urban co-planning (Zedda R., 2009, p. 61). Chronomaps are technical maps, enabling exact measurement of urban spatial and temporal configurations. They are designed to be used by technical sectors of the public administration (GIS Office, Urban Office,…) for the design and monitoring of time-oriented policies. The topography should be able to include the strategic layers of the chronographic information system of the municipality, with essential information on populations, mobility and the historical construction of places. The composition of the different level of information present in this type of map is determined interactively during the policy making process. The map should be able to provide technical information to co-design roundtables and to interact with experts and stakeholders, enabling the construction of a collective intelligence of urban time. In order to be used in a participatory methodology, chronomaps develop communication codes which are almost natural-language codes, but in a way that is always technically rigorous (Stabilini S., 2001, in Bonfiglioli S. (a cura di), pp. 69-70). A dynamic map of open/close activities is generated by geo-referencing the shops and services that are open or closed at different times of the day. The map adopts a codified language suitable to convey temporal information in an effective way: time is a relatively new feature to cartography and requires a specific language that is still being developed. In our case, bright yellow colour is used to distinguish which activities are “ON” (in operation) from the ones that are “OFF” (not in operation), a “natural” symbolism in this kind of maps. Inhabitants, indicating with different colours: children; young people; old people; students; marginal people. 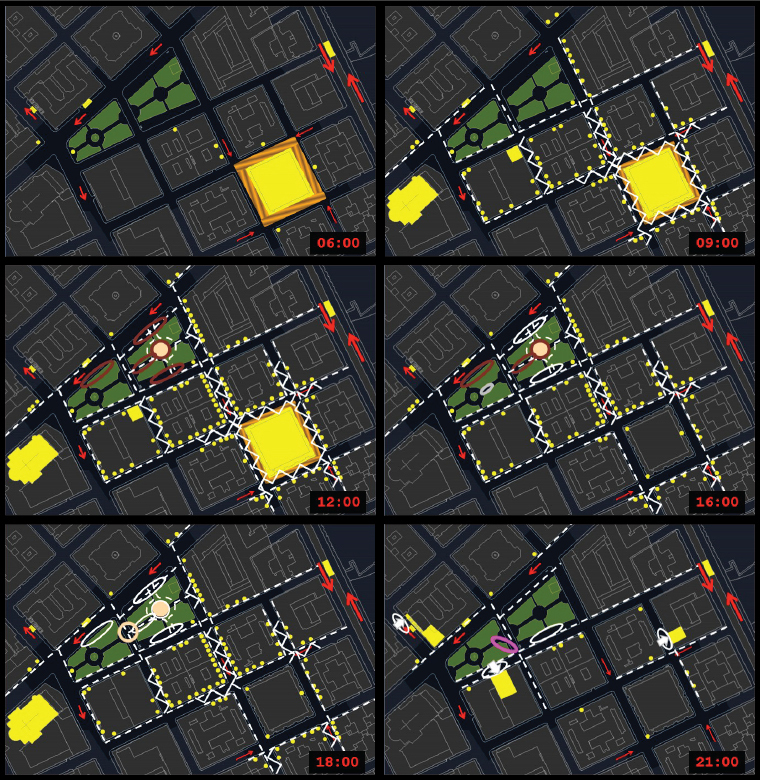 These maps aim to represent space and time in one single visualisation: not only is the operation of different activities represented in time, but also within a system of spatial mobility behaviours. The photographic sequences were produced with the technique of time-lapse: mounting in fast sequence, in order to suggest the motion, photos taken at regular intervals (every 5 seconds). We chose to move the point of view from which the photos were taken alternately in the two squares, focusing, at different hours of the day, on the main attractor, the element that at a specific time primarily characterises the utilisation of that public space. The selected point of view always tries to show the relations between the main attraction and the public space in front of it (relation market – street – sidewalk – commercial and public services; relation playground – crosswalk through the square – public areas equipped with benches; relation theatre – pavement – street – parking). Through the combined use of chronomaps and photography, we produced a video of 8 minutes that tries to capture part of the different identities that two adjacent squares in a working class neighbourhood of Rome during one day. The video reconstructs what happened in Piazza Testaccio (market area) and Piazza Santa Maria Ausiliatrice, on Friday, November 25th 2011, during a “working day”, in winter, with sunny weather. Using visual observation, we tried to observe and tell, from two different points of view, how the identity of these places is constantly redefined in a timeline of 24 hours. We tried to convey the sound of urban public common space (square, park…), in a residential neighbourhood of a big city; a public space in which there are different public places (market, shops, theaters, church…) that attract different people at different times of the day. Piazza Testaccio 5:30 a.m. – 9:00 a.m. Market opening time. Piazza S. M. Liberatrice: 10.30 a.m. – 1.00 p.m. Playground, part of the square in the sun. Piazza Testaccio, 1.30 p.m. – 3.30 p.m. Market closing time and street cleaning. Piazza S. M. Liberatrice, 4.30 p.m. – 6.30 p.m. Playground in the afternoon with children coming out from school. Piazza Testaccio, 7.00 p.m. – 8.30 p.m. Bars, closing time of the latest stalls (florist). Piazza S. M. Liberatrice, 8.30 p.m. – 11.30 p.m. Entrance and exit to/from the theatre. Our research was initiated in order to test an instrument that could be used for the participation of actors in co-design workshops. The methodology described can be viewed as a playful way of completing technical knowledge with more tangible visualisation techniques in order to convey information to the general public. Introducing this as a tool of communicating and visualising the transience of a place can help participatory approaches. The video is a cognitive tool for understanding the place, its rhythm, and its perception by the inhabitant. Co-design workshops and chronotools can support actors in their definition of the problem, understanding the place as a part of an “inhabited city”. The use of chronotools in a co-design process in defining a space-time problem can support in turn the creation of a a space-time project. — Bonfiglioli S. (2009), “Time Studies in Urban Development: An Italian Innovation”, in Urban Planning Review. — Bonfiglioli S., Boulin J.Y., Mückenberger U. (in corso di stampa), Progettare i tempi della città in Europa. Tempi, metodi, casi. — Gabellini P. (1996), Il disegno urbanistico, NIS, Roma. — Gwiazdzinski L. (2002) (a cura di), La ville 24 heures sur 24: regards croises sur la société en continu, Aube, La Tour d’Aigues. — Ludovico S. (2003), The relationship between cartography and photography to build a point of view on the territory, tesi di laurea in Pianificazione Territoriale Urbanistica e Ambientale, Politecnico di Milano. — Lynch K. (1964), L’immagine della città, Marsilio editori, Venezia. — Martinotti G. (1993), Metropoli. La nuova morfologia sociale della città, Il Mulino, Bologna. — Wang W. (1995), Smoke, film, USA. — Zanettichini L. (2010), Carte cronografiche per l’analisi urbana. La nuova stagione dell’ urbanistica temporale a Bergamo, tesi di dottorato in Luoghi e Tempi della Città e del Territorio, XXII ciclo, Università degli Studi di Brescia. — Zedda R. (2009), Tempi della città. Metodi per l’analisi urbana, Franco Angeli, Milano. 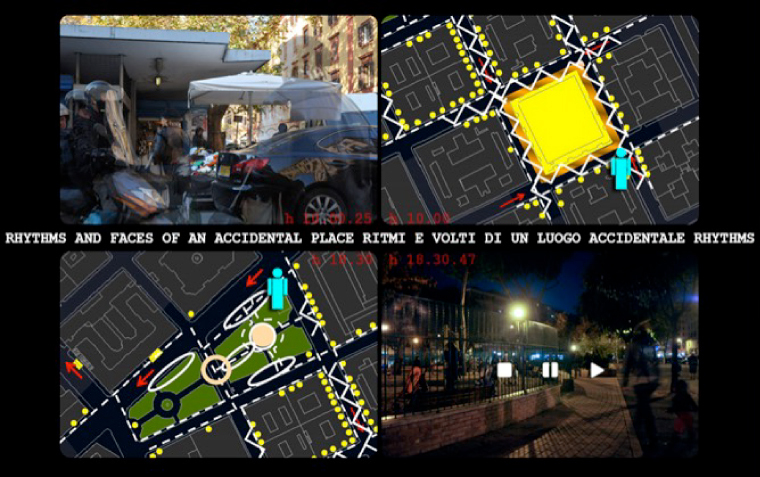 Rhythms and faces of an accidental place was presented in Urban Transcripts 2011, “Rome, the accidental city” exhibition and conference, in Rome, Italy, December 2011. Simone Ludovico, Urban Planner and Photographer, studied Urban, territorial and environmental planning and graduated from the Polytechnic of Milan in 2003 with a thesis on the relationship between cartography and photography. He works like a freelance photographer since 2004 and currently develops multimedia projects in collaboration with associations that deal with social issues. He also works in schools as a special aid teacher. Lucia Zanettichini, Urban planner (Dr.), studied Urban, territorial and environmental planning at Politecnico di Milano. Graduated in 2002, she began collaborating in a research lab of Politecnico di Milano, focusing at development of chronomap tools, instruments for the measurement and drawing of space-time urban shapes. She has been involved in multidisciplinary researches and in projects with municipalities, working on database construction, space-time analysis, chronomaps and chronoGIS. During her PhD research she has investigated the relationship between space-time tools and traditional planning tools. She has worked as a teaching assistant and contract professor in a Laboratory of Urban planning for the environmental quality of Politecnico di Milano. Lucia worked as consultant in local development projects, she currently works as a technical education teacher.